The most common cause of chronic mesenteric ischemia (CMI) is atherosclerotic disease, accounting for over 90 % of cases in most series. Atherosclerotic lesions usually affect the origin or the proximal 2–3 cm of the mesenteric arteries, frequently with associated plaque in the aorta and renal arteries. Because of the extensive collateral network, the majority of patients with symptoms of CMI have significant stenosis or occlusion of at least two of the three mesenteric arteries. However, contrary to what has been propagated in many surgical textbooks, this is not an absolute requirement. 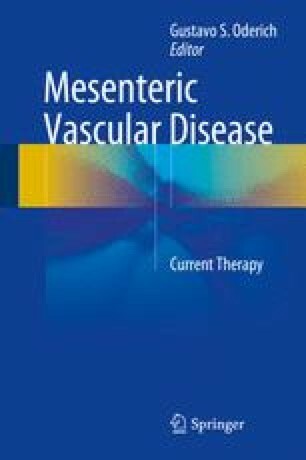 The clinical significance of ischemia correlates not only to the extent of disease but also the adequacy of collateral pathways, acuteness of symptoms, and presence of arterial steal; approximately 2–10 % of patients with CMI have single-vessel disease, which affects primarily the SMA and patients with poorly developed collaterals or more acute presentation, as might be predicted from the postprandial hyperemic response.